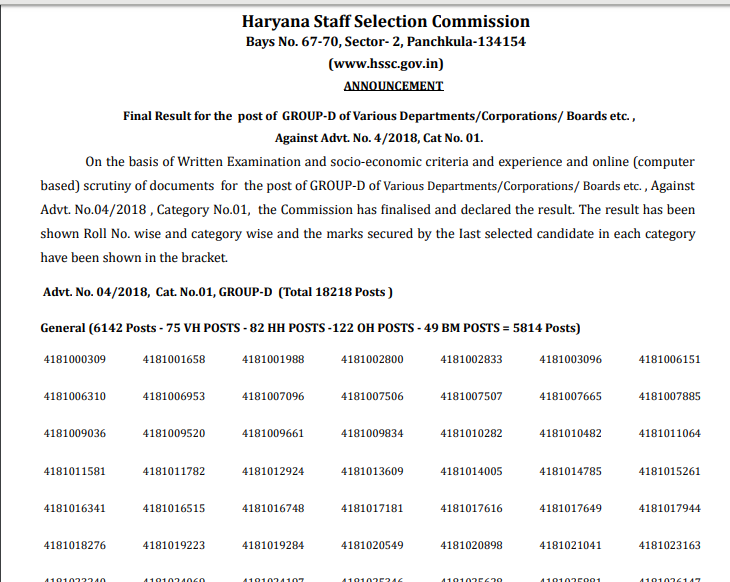 HSSC Group D Result 2019 - Haryana Staff Selection Commission (HSSC) will announce the result of HSSC Group D written exam. HSSC Group D result 2019 will be available online in pdf format. The result PDF file displays the category-wise and roll number wise lists of qualified candidates. After the declaration written exam, HSSC Group D result 2019 final result will be declared based on candidates performance in written examination, socio-economic criteria and experience and document verification. Shortlisted candidates will be offered the appointment to Group D posts in various departments/corporations/boards etc. Read this article below to check the details about HSSC Group D result. Candidates can check the steps to download HSSC Group D result 2019 below. The result of HSSC Group D 2019 will be declared on the basis of marks secured in the written exam and socio-economic criteria and experience and document verification. The result pdf will be displayed in pdf format. HSSC Group D result will have the roll number of candidates who have qualified the exam. On the basis of HSSC Group D 2019 result, candidates will be recruited for Group D posts. The cutoff of HSSC is minimum qualifying marks candidates must secure to qualify the exam. HSSC releases the cut off of HSSC Group D category wise. Candidates who secure the cut off will be eligible for the exam. To determine the cut off factors like the total number of vacancies, the difficulty level of exam and number of appeared candidates are taken into account. HSSC Group D cut off will be released after the declaration of result. Check previous year HSSC group D result below.